"What? What do you mean? Oh! Oh... no... No!" Ennodius Papius, an Imperial, is a former lumberjack now living an isolated existence in a small camp a short distance up the hill from his old workplace, Anga's Mill. He is one of the first assigned targets after joining the Dark Brotherhood. He does not exist prior to the related quest. He wanders around all day long, at times sitting on a nearby rock, and, if the weather gets tough, warms his hands over the fire. At midnight he crawls into the tent for eight hours of sleep. He wears a set of farm clothes and a pair of boots. He is equipped with an iron dagger, and carries a selection of lower-class loot and gold. Leifur: "Whatever happened to Ennodius? He just up and left." Kodrir: "Don't know why you're asking me. But I'm glad that damn Imperial is gone. Something wrong about him." Leifur: "You're all heart, Kodrir. I bet Lady Mara is weeping a special tear for you right now." When you approach the paranoid Imperial at his camp, he will be quite anxious, asking: "Why are you here? Get away from me!" "You were right to be paranoid, Ennodius." "What? What do you mean? Oh! Oh... no... No!" (Remain silent) "Who are you? You... you're with the Dark Brotherhood, ain'tcha? I knew it. I knew you'd come for me!" All three options will make him flee with the words: "By the gods! Somebody help me!" When the deed is done, a return to Nazir will make him ask: "How went your meeting with Ennodius Papius? Did you prove his paranoia legitimate?" When you tell him that Ennodius is no more, he will jokingly say: "Good. And I hope you were careful in that lumber mill. Those splinters and rusty nails can be quite nasty." 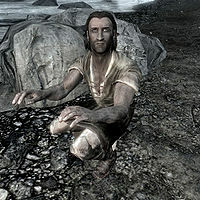 Ennodius was supposed to be able to tell you a bit about himself if you met him outside the related quest. However, since he only spawns during the quest, this dialogue will never be heard: "I used to work at Anga's Mill, but I... I had to leave. ", "Someone's after me I tell you. They're watching me. Somewhere." and "Don't talk to me. You could be one of them." 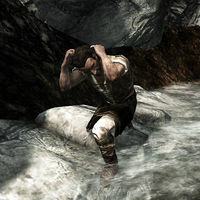 Under the waterfall that is just upstream from Ennodius' camp, there is a small amount of loot: a barrel and a strongbox. On the stream bed three yards or so downstream from the strongbox, under the water, there are two quicksilver ingots that are very difficult to notice unless you pass directly over them. This page was last modified on 2 March 2019, at 10:04.